PROHIBITION, directed by Ken Burns and Lynn Novick, tells the story of the rise, rule and fall of the 18th Amendment to the U.S. Constitution. The film starts with the early history of alcohol in America and examines the 19th-century temperance and progressive movements through the repeal of the 18th Amendment in 1933. This six-hour three part documentary also includes over two hours of bonus content. 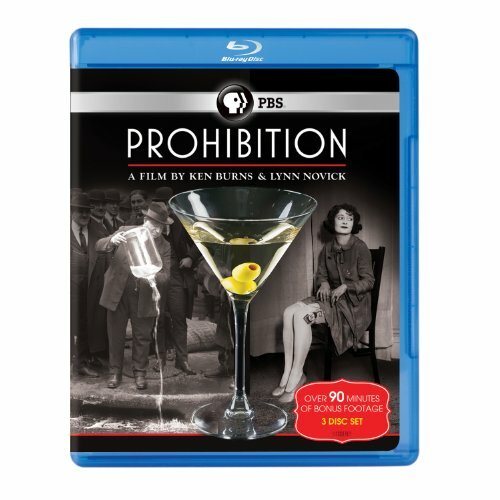 It's hard to comprehend now, but nearly a century ago, Americans were denied both the pleasures and evils of alcohol for a period of almost 14 years--a strange and tumultuous time chronicled in edifying detail in Ken Burns and Lynn Novick's Prohibition, a three-part (and three-disc) documentary first broadcast by PBS. Part One, "A Nation of Drunkards," contemplates the lead-up to Prohibition. And a long lead-up it was, as preachers, women alarmed by their husbands' debilitating drunkenness, and others were railing against the evils of drinking nearly 100 years before the 18th Amendment, which banned "the manufacture, sale, or transportation of intoxicating liquors," went into effect in January 1920. Calls for temperance in the mid-19th century soon gave way to strident demands for total abstinence, influenced by groups like the Women's Christian Temperance Union and the Anti-Saloon League, along with self-righteous crusaders like Carrie Nation (who wielded a hatchet as she decimated drinking establishments in her home state of Kansas). Once the federal income tax was introduced, thus eliminating government dependence on liquor taxes--which at one point accounted for 70 percent of all US revenue!--the path to passage of the amendment was cleared. But in their zeal to impose their morals on the rest of the country, the "Drys," as they were called, failed to foresee that enforcement of the amendment and its harsh enabling legislation, the Volstead Act, would be nearly impossible. That issue is examined in Part Two, "A Nation of Scofflaws," which describes the deluge of bribery, corruption, defiance of the law by ordinary citizens (the "Wets"), and, perhaps most notably, the enormous amounts of money to be made from the distribution of illegal liquor (which in turn led to the rise of Al Capone and many, many other powerful gangsters) that came in the law's wake. In Part Three, "A Nation of Hypocrites," we witness the ultimate failure of Prohibition, culminating in the repeal of the 18th Amendment in 1933. In the end, we're told, the rigid religious fundamentalism of the Drys, who refused to consider even the slightest modification of the law, was the principal cause of its downfall--accompanied, of course, by the simple fact that people love to drink.